You are currently browsing the tag archive for the ‘beverage’ tag. Amazing. Although I throw that word around a lot on this blog, I wholeheartedly had wonderful time here. The food was great and the beers, exceptional. 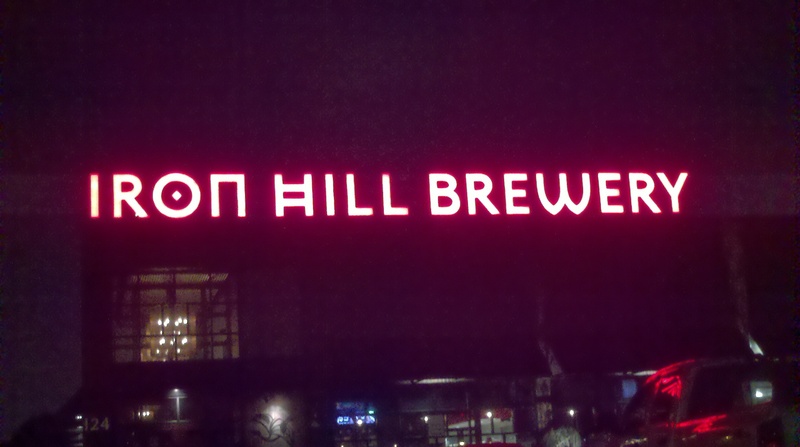 Iron Hill Brewery is a brewery first and a restaurant second. All the beers are brewed in house and you could tell from drinking the beers. When asked for our drinks, I immediately ordered the 8 beer sampler which included all the house beers and 2 seasonal beers. 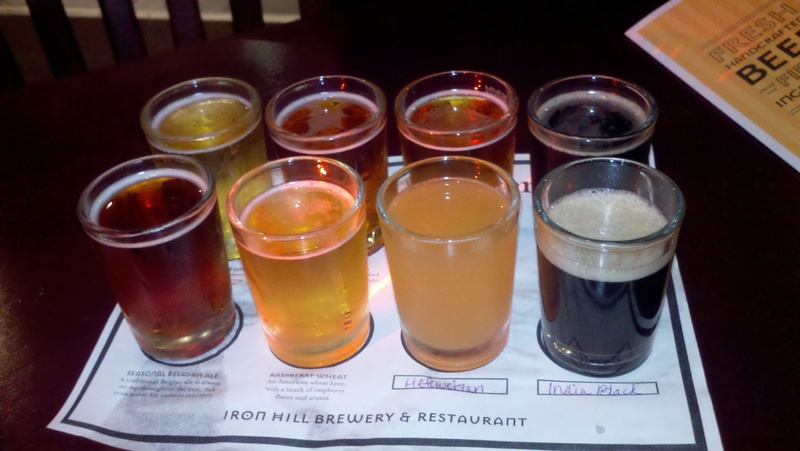 The house beers were the Iron Hill Light Lager, Vienna Red Lager, Ironbound Ale, Abbey Dubbel, Pig Iron Porter, and the Raspberry Wheat. 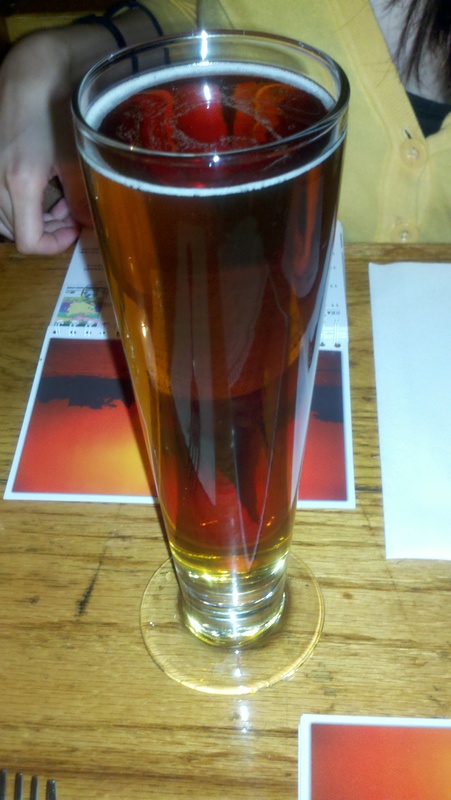 The seasonal beers I selected were Hefeweizen and the India Black Ale. The colors, aromas, and taste of the beer were all exceptional and had a great time drinking and trying all the different kinds. Although they have a huge selection of food, we came a bit late so the menu changed after 10 PM. We had to select from the late night menu which consisted of upscale bar food, which we were okay with. 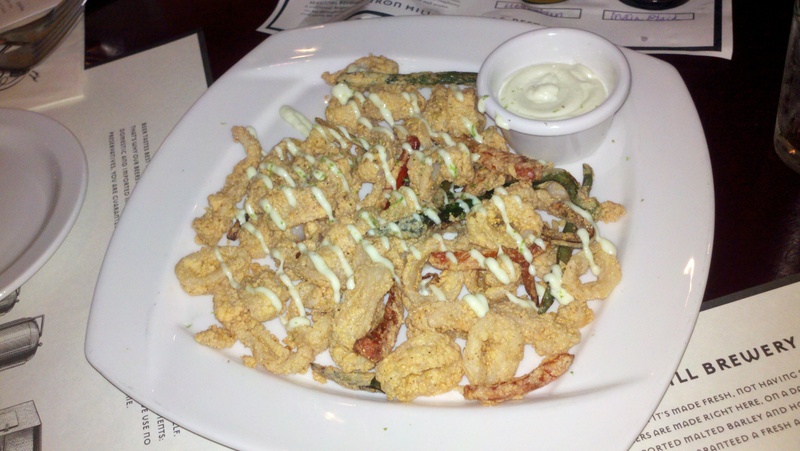 Our appetizer was the buttermilk fried calamari which was very crispy and worked very well with lime zest dipping sauce. 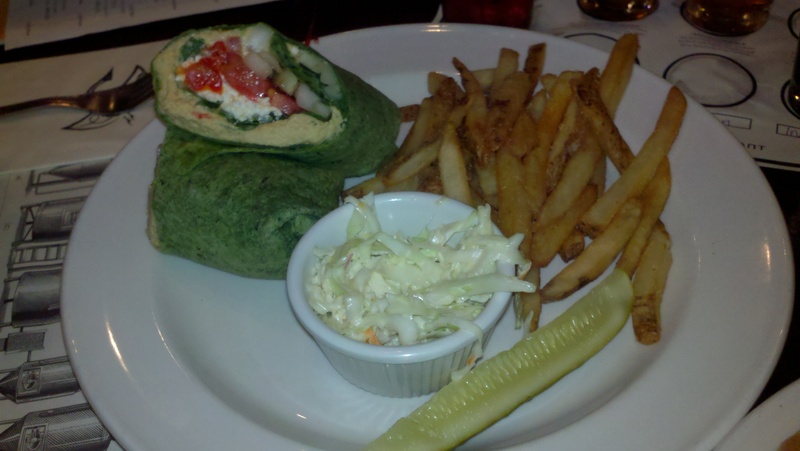 Cindy had the Mediterranean Wrap which consisted of cucumbers, hummus, roasted red peppers, tomato, arugula, feta, and balsamic syrup in a spinach wrap. Very tasty and the cool cucumbers pops in your mouth for a very nice contrast to the other textures. 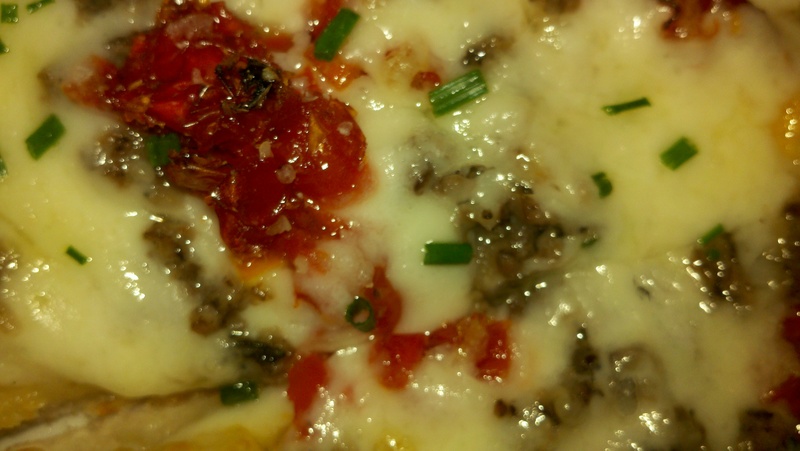 Finally, the Exotic Mushroom Pizza was hearth baked with truffle oil, sun-dried tomatoes, asiago, and mozzarella cheese. 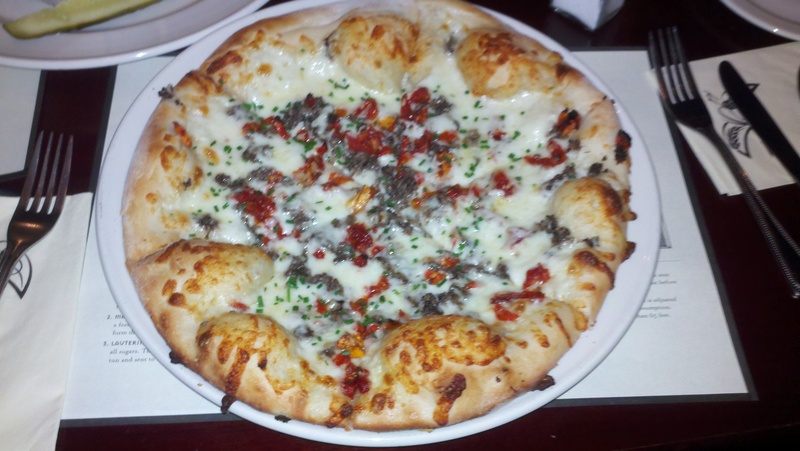 Very cheesy and earthy from the truffles on the pizza. Was hesitant in ordering a vegetarian pizza but was completely satisfied with my decision after the first bite. If not for the food, please go for the beers! John and I were craving for some Japanese food and we arrived to Sake Bar Hagi only to discover that it usually opens around 5pm. It was 4pm and we were also on a time crunch so we decided to try Iroha Japanese Restaurant which was located right next door. One word: mediocre. However, that doesn’t necessarily mean it’s horrible. It was also inexpensive. 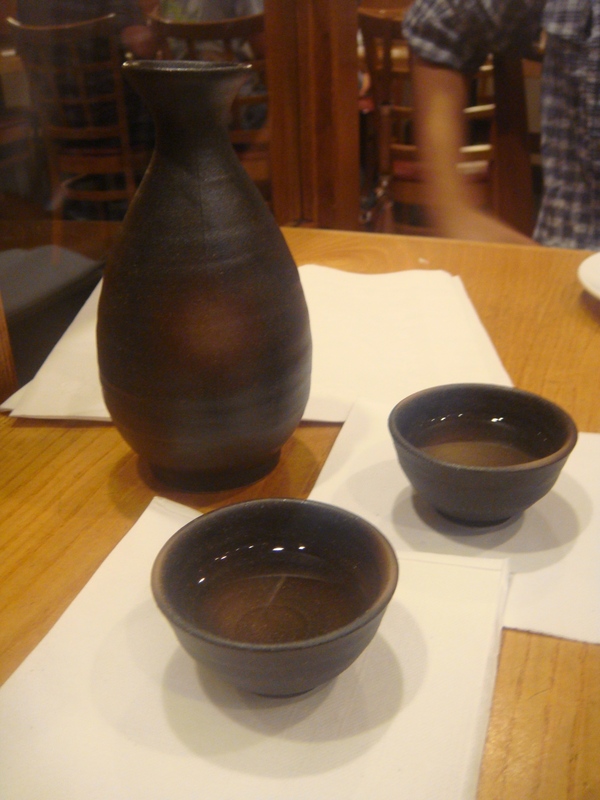 We ordered warm sake and we both ended up taking quite a few shots each. 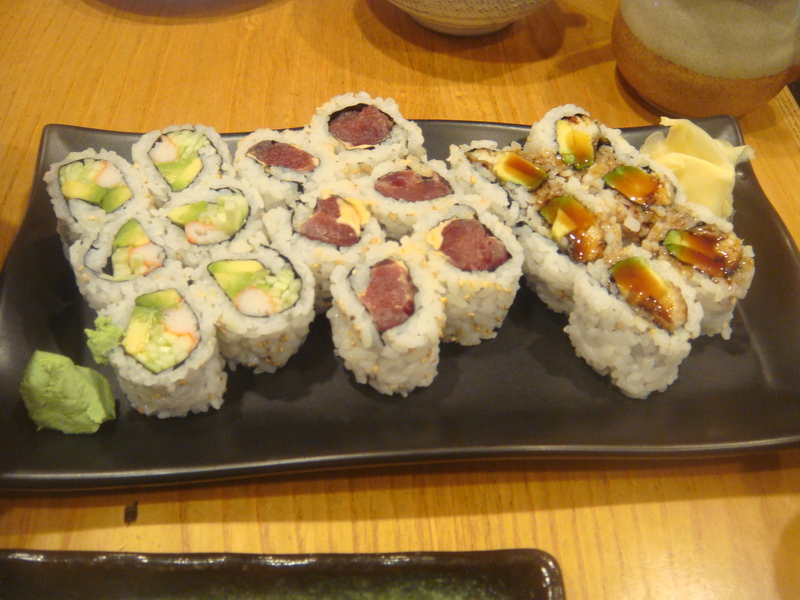 John ordered the 3 sushi roll combo: California roll, spicy tuna, and eel with avocado. 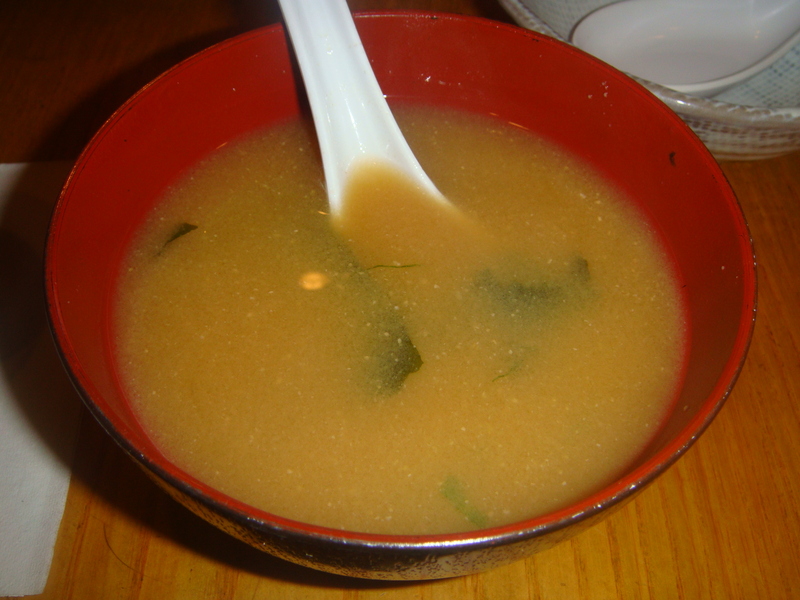 It also came with a small bowl of miso soup. I ordered the bowl of udon (common Japanese noodles) with tempura (deep fried seafood/vegetables) and it also came with 2 pieces of inari sushi (fried tofu stuffed with sushi rice – good for vegetarians). 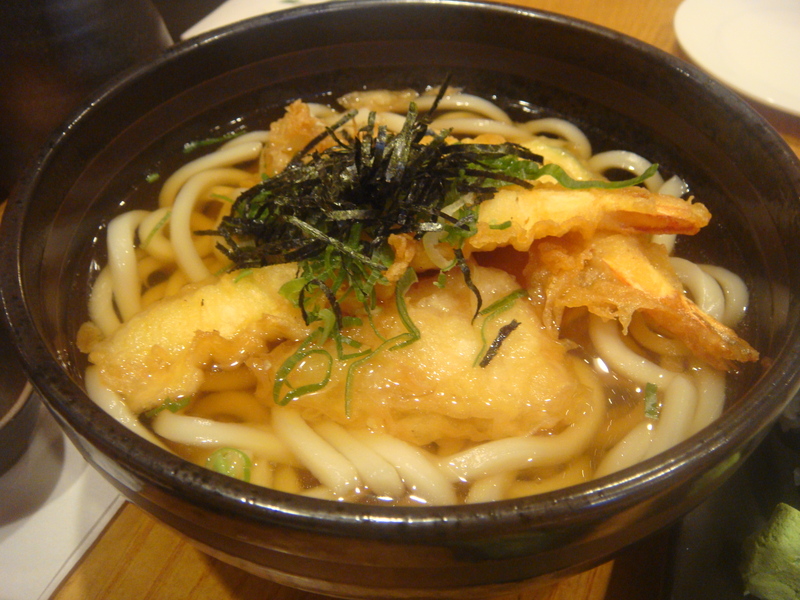 I never had udon topped with tempura before. I would probably prefer those two things to be separate because it became extremely soggy from the broth. The broth was tasty and good enough to be consumed. The sushi rolls were also delicious but nothing special. There are definitely better Japanese restaurants than this one. I want to start this post off by saying that this place was pretty delicious. Ahgujjim is steamed fish in a spicy mixture with vegetables. The fish was very delicate and moist. 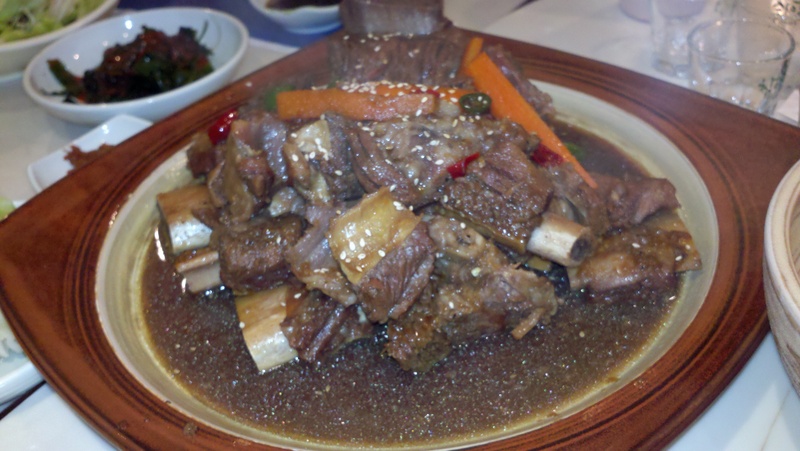 The Galbijjim is steamed beef ribs which melted in my mouth in all of its fatty glory. 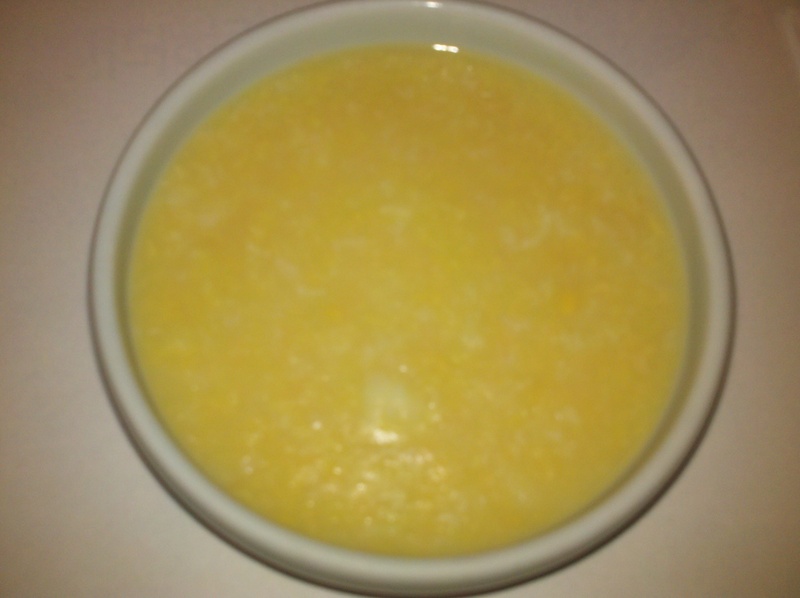 (Jjim is put at the end of food names to indicate that it was steamed). 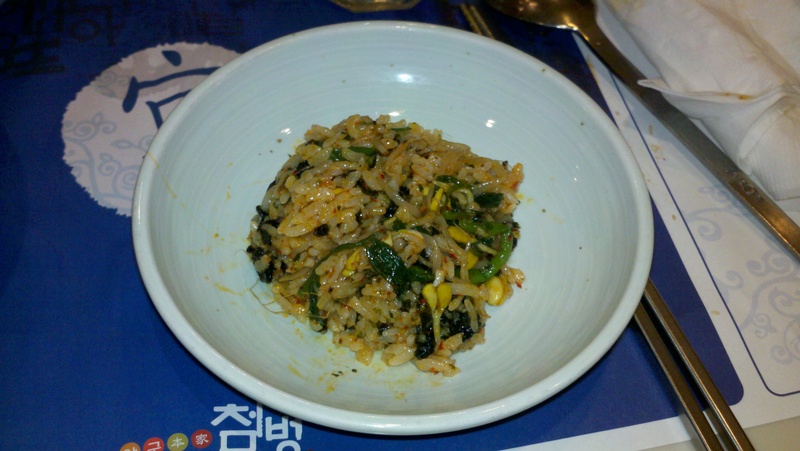 the Bibimbop (mixed vegetables with rice) complimented the other dishes very well. I washed it all down with a couple of glasses of Hite beer (very watery and sub par) and some Chumchurum Soju (which is alcohol from barley, sweet potatoes, rice, etc.) which is always a plus. 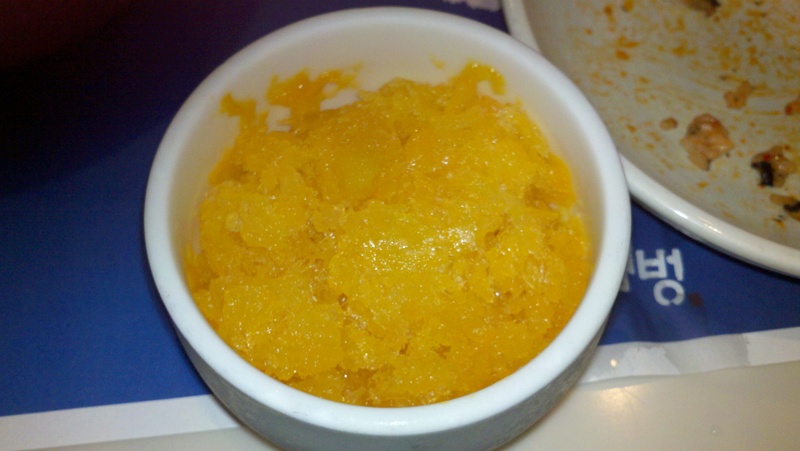 After the meal was complete, we were given some sort of shaved pumpkin ice which tasted extremely weird. Very bad way to end a wonderful meal. 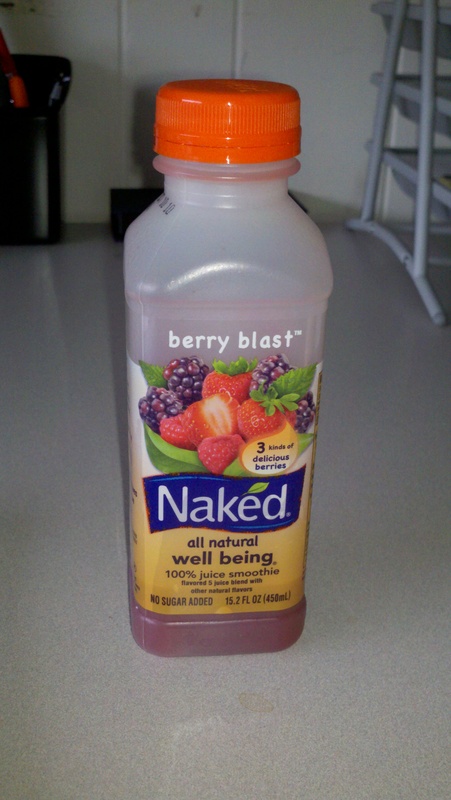 It is one of my favorite Naked Juice flavors. Made from strawberries and blueberries, it is very heart and makes you full afterwards. Highly recommended. 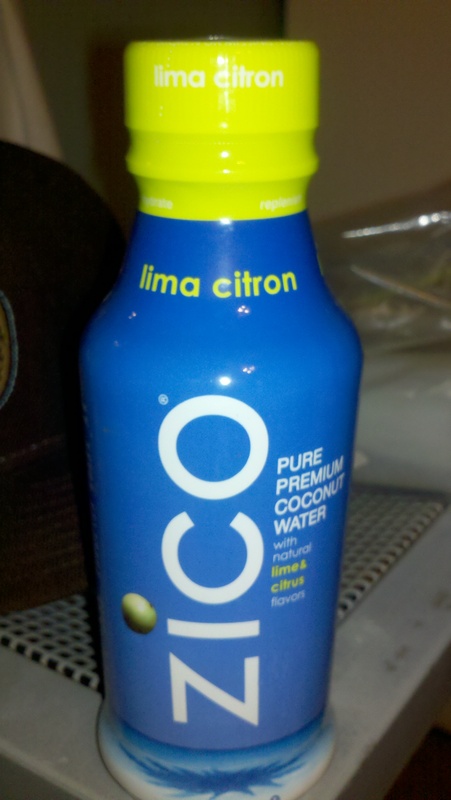 Coconut water with hints of natural lime juice. 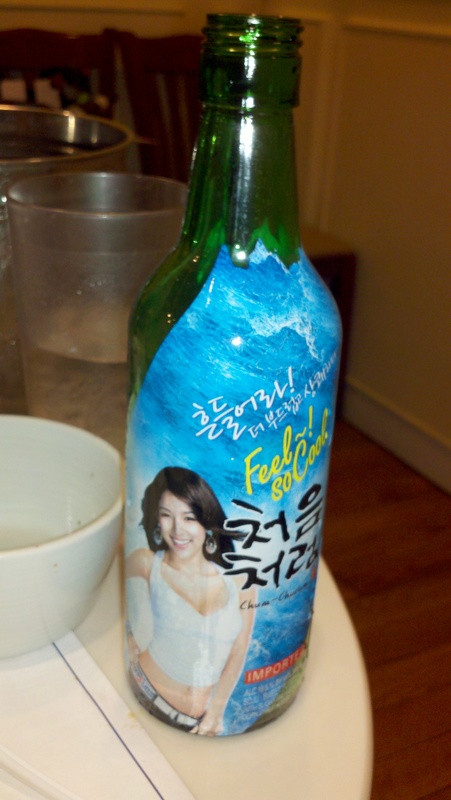 I was kind of scared to drink this because the bottle was not see through and I did not know what the drink looked like. The taste was also an acquired one. Not a big fan of coconut water. 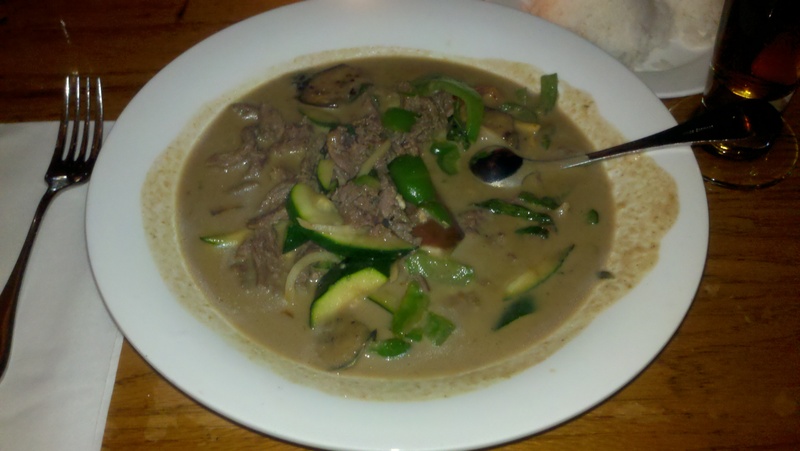 We’ve been meaning to try out Thai food at Sea Thai Restaurant, located in Williamsburg, Brooklyn. We decided to head there for dinner yesterday and we arrived at around 9pm. We didn’t make reservations so we ended up waiting for an hour; which was fine because we weren’t starving. After an hour we finally made it inside. It was extremely crowded because there was also a bar located next to the entrance. The ambiance was nice and it looked very modern inside. John and I came in at a time when the DJs started blasting the music extremely loud. It is probably different during the daytime since we went on a Saturday night. It was so loud that it was extremely hard to converse at the table. Some people would probably find it obnoxious so beware. John started off with a huge glass of Brooklyn lager. The menu had a lot of choices and the prices were also reasonable for the amount of food we received (around $10). John decided to get the Patpong green curry with beef and I decided to get the lemongrass chicken with mixed vegetables and chili sauce. Both dishes came with some white rice on the side. Both of our dishes came out pretty quickly and the service was good. Overall, the food tasted delicious but it was nothing to brag about. John’s curry dish came out pretty tasty and flavorful. My lemongrass chicken with mixed vegetables tasted healthy. 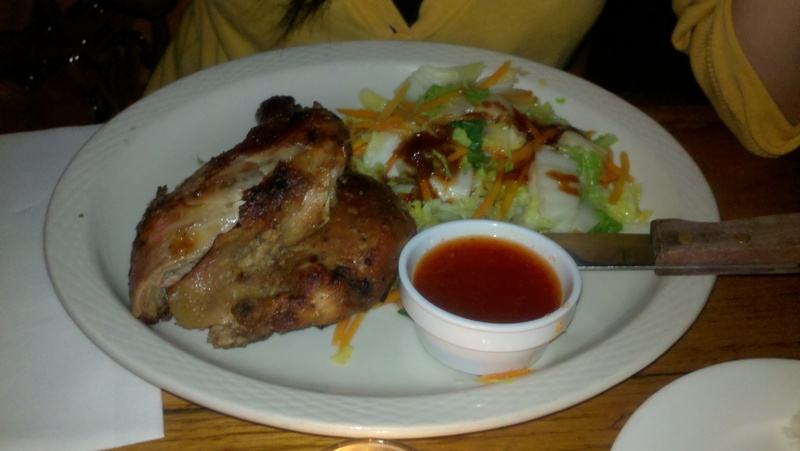 The chicken was juicy and tender and the meat came right off the bone. The chili sauce was placed separately in a small bowl and if you pour it over everything, it gives it a kick. We would definitely come here again if we are craving for inexpensive Thai food. A manager at my work place bought everyone (almost everyone) bubble tea. 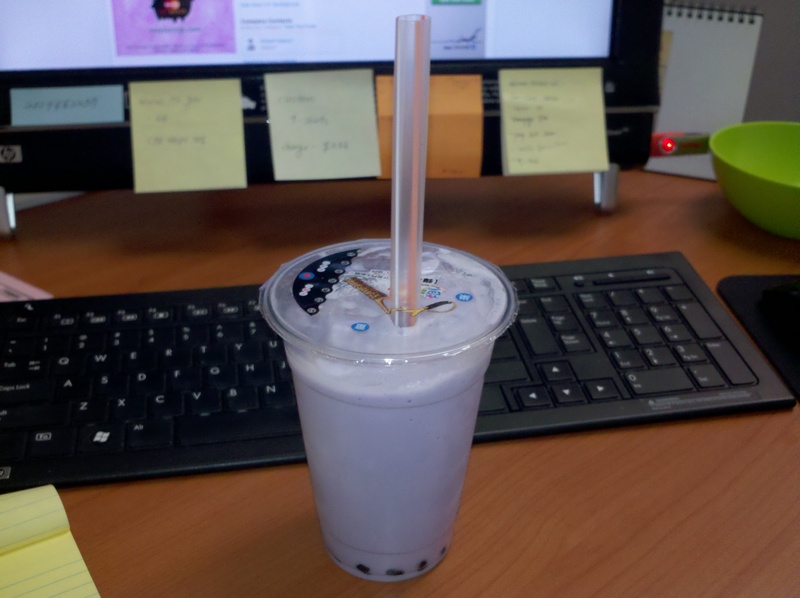 I think taro is the best flavor. P.S. I love my wireless keyboard, mouse, and touchscreen 20″ monitor at work! I want to take it home with me. 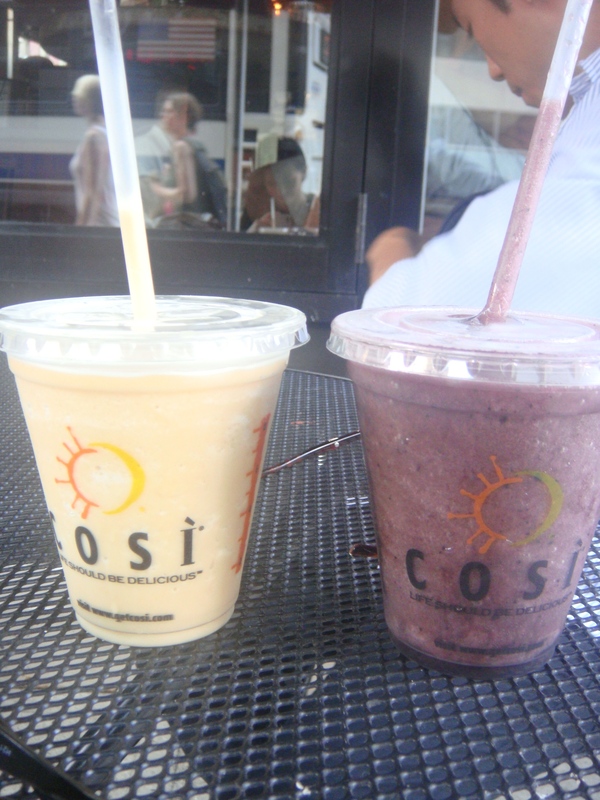 Prior to watching the film Inception, John and I decided to grab something cool to drink at Cosi Cosi, a sandwich bar located in Union Square. I ordered the blueberry pomegranate smoothie while John decided to get the blended frozen Arctic Latte. We both thought it was delicious. John said he couldn’t tell the difference between his drink and the one at Dunkin Donuts. Our drink costs about $4 each (size tall). What we disliked about Cosi Cosi was the service. Patrons weren’t allowed to sit at the small tables unless they were planning on having table service. We got kicked out of the table and were forced to sit somewhere else. The layout of the whole entire restaurant was confusing. We also assumed it was like Starbucks where we could sit wherever we wanted. We decided to sit outside on their tables/chairs in the heat and humidity. Luckily we were done drinking when this random drunk guy decided to puke on the ground in front of Max Brenner, which was a few feet away from us. It was quite horrendous, especially when the putrid air started to head towards our direction. We immediately left the scene and into the movie theatre. 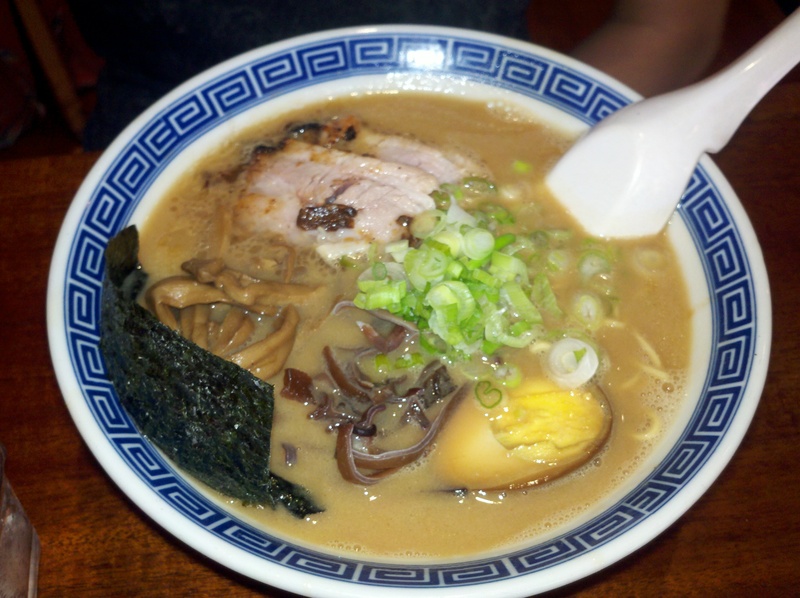 My girl suggested we go to eat some good authentic Japanese Ramen at the East Village in New York City. By chance, that day was also one of the hottest days of the summer so far. Right when we entered the tiny boutique ramen restaurant, we were blasted with hot air coming from the kitchen which was basically on top of the patrons who were eating there. The small place did not seem to have an air conditioning unit but we decided to stay and eat some ramen since the journey to get here was a long one. 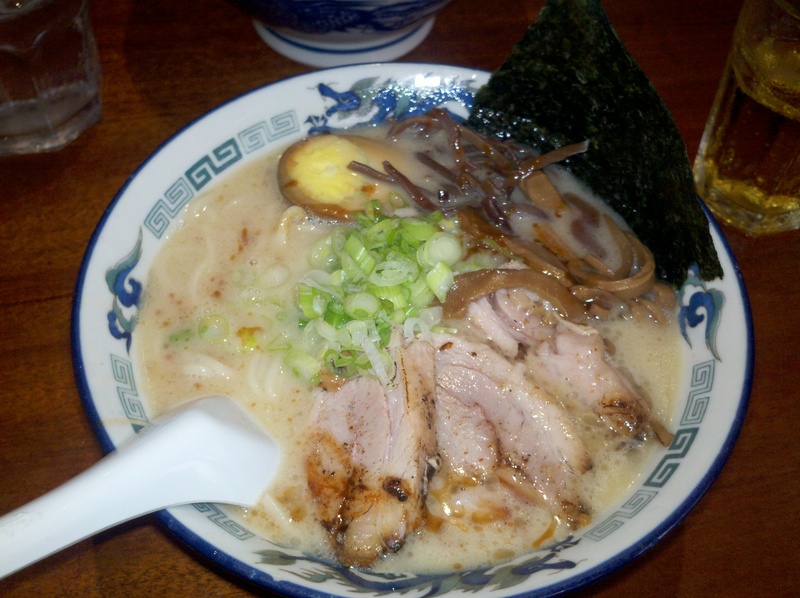 My girl ordered the Shoyu ramen which was soy sauce based pork broth ramen and I ordered the basic pork broth ramen which was garlic based, both with thick noodles. 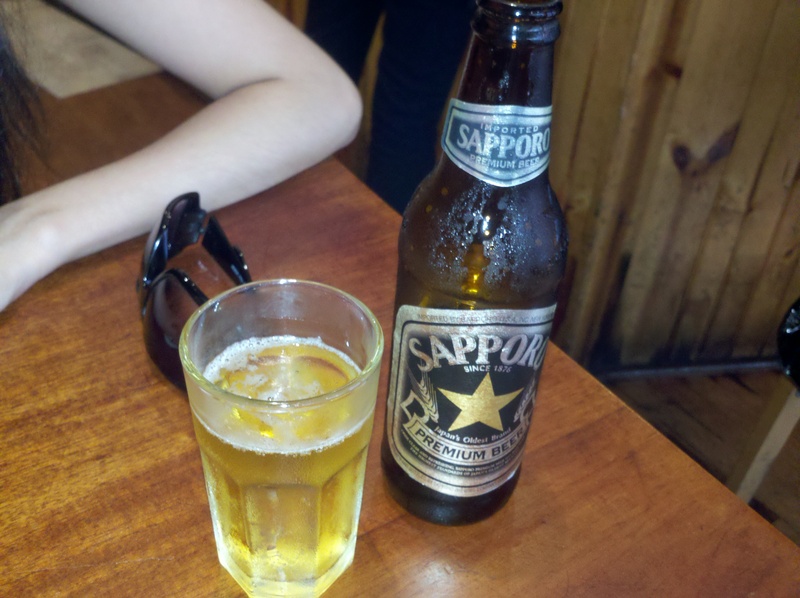 I also ordered a Sapporo to cool down while we were waiting for the food. The first thing I noticed taking my first bite was how well the noodles were cooked. They were cooked to perfection being al dente of course. My broth was incredibly garlicky which I did not expect and my girl’s broth was sort of salty (maybe because of the soy sauce?). Both dishes came with a sheet of nori (toasted seaweed), mushrooms, fatty pieces of pork, and various vegetables. Overall I was pleasantly surprised and would eat there again but this time order a more neutral flavored broth. P.S. This place needs air conditioning ASAP! 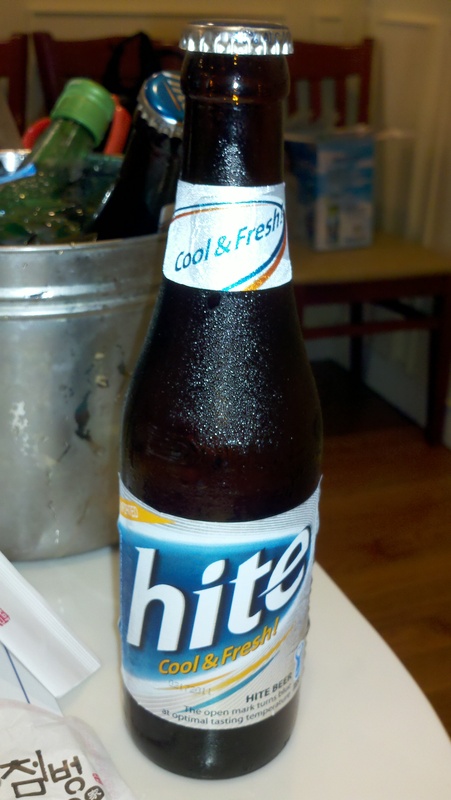 I went into this Korean restaurant, once again, and did not know what to order. I wanted to eat something I have not had much of so I ordered Ddaro Guk Bap. The meal started off with a Korean styled split pea soup. Honestly, I cannot differentiate between split pea soup at a American restaurant and split pea soup at Todam. It was hearty and was a welcome start to the meal. Then came the main dish, ddaro guk bap. 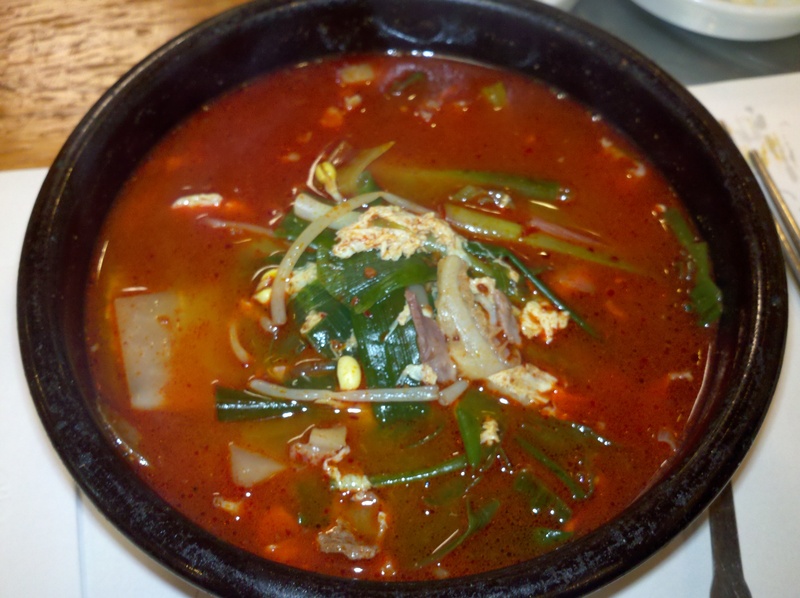 This dish is basically a spicy soup with beef, scallions, bracken fern, onions, and more. Extremely spicy and delicious. I dumped my bowl of rice in the soup and ate it together. 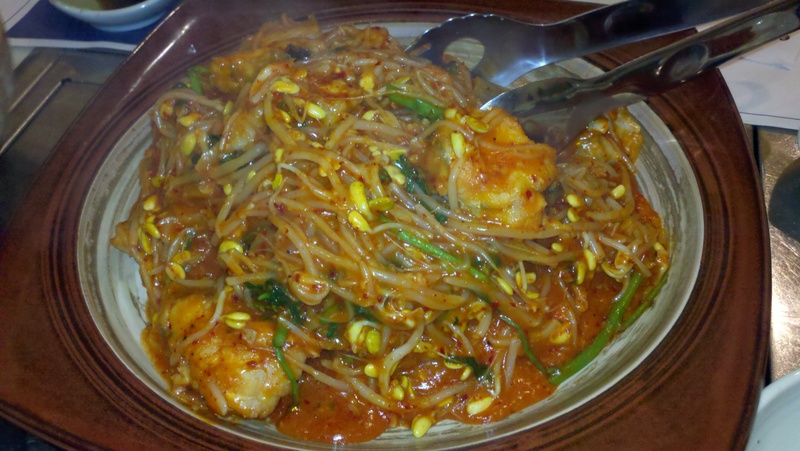 If you are not a fan of spicy foods, I do not recommend this dish. 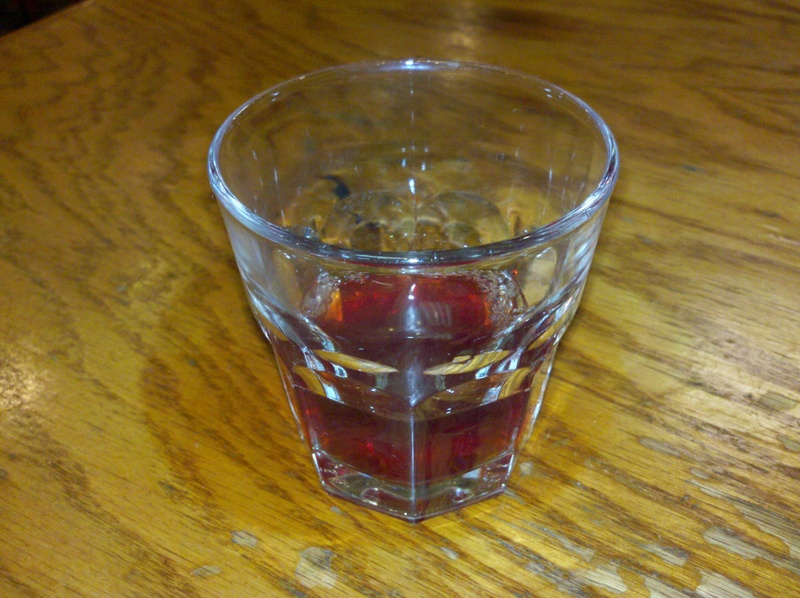 The meal ended with a cold ginger tea which cleansed the pallet. Overall, it was a very good meal.